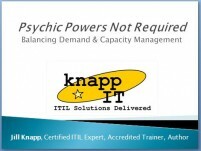 Instructor Stuff « Knapp I.T. ITIL Foundation Training typically costs in the neighborhood of $1000-$1200 per person, whether it’s delivered in a classroom in person, or live online. Some people don’t have that kind of money laying around, but they need the ITIL Foundation certification! What’s a techie to do? The good news is that taking training through pre-recorded videos costs less than live . . . In this handy Excel spreadsheet, simply enter the exam start-time in the obvious box, and . . .